If you're on a mission for a casual yet seriously stylish getup, consider teaming a blue denim jacket with tobacco skinny jeans. Both garments are totally comfy and will look great together. 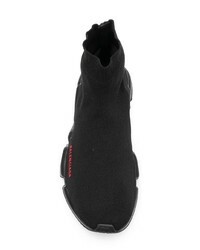 To bring out the fun side of you, complete your getup with black canvas high top sneakers. 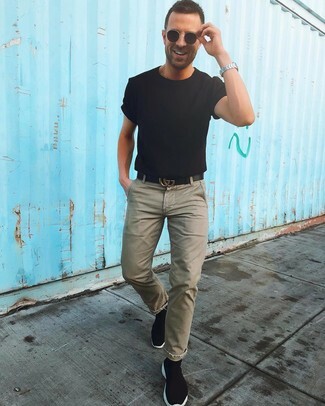 This off-duty pairing of a black crew-neck t-shirt and olive chinos is extremely easy to pull together without a second thought, helping you look sharp and prepared for anything without spending too much time rummaging through your closet. Add black canvas high top sneakers to the mix to immediately kick up the wow factor of your getup. If you're all about feeling relaxed when it comes to dressing up, this combination of a yellow tank and charcoal sweatpants is just what you need. 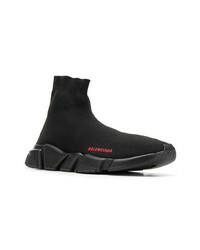 Complement your getup with Balenciaga speed sock sneakers. 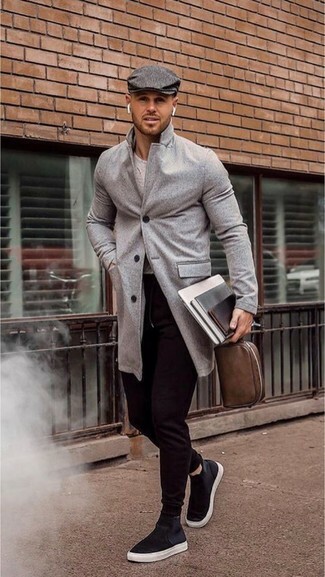 If you're hunting for a casual yet sharp outfit, marry a grey overcoat with black sweatpants. Both garments are super comfy and will look amazing when worn together. For something more on the daring side to complement this look, make black canvas high top sneakers your footwear choice. 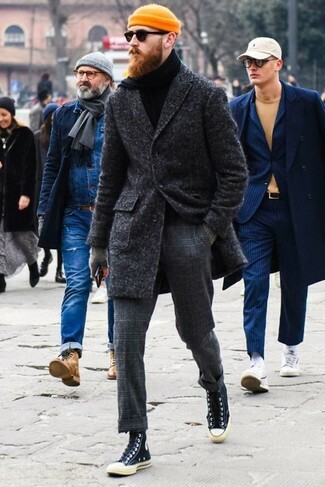 Choose a charcoal overcoat and charcoal check wool dress pants for a classic and refined silhouette. For something more on the daring side to complete this ensemble, opt for a pair of black canvas high top sneakers. If you're on the hunt for a casual yet stylish ensemble, try pairing a white and red and navy plaid long sleeve shirt with olive chinos. Both garments are very comfortable and will look great together. Go for a pair of black canvas high top sneakers to have some fun with things. Tap into refined, elegant style with a black and white houndstooth overcoat and black dress pants. To bring out the fun side of you, complement your look with Balenciaga speed sock sneakers. 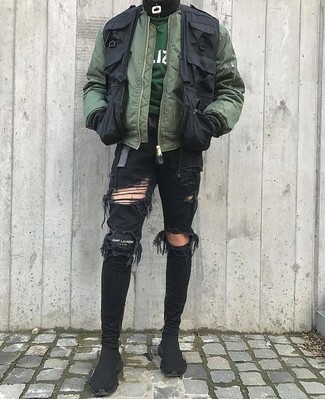 We all seek comfort when it comes to dressing up, and this combination of an olive bomber jacket and black ripped skinny jeans is a practical illustration of that. 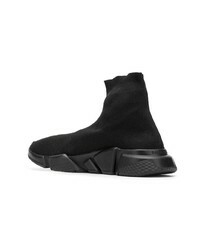 With shoes, opt for a pair of Balenciaga speed sock sneakers. 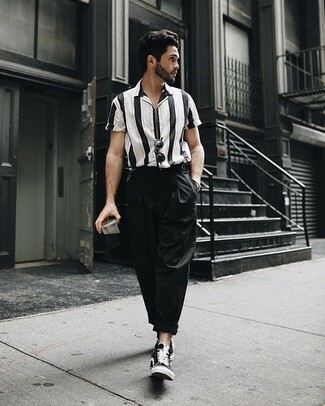 If you're on a mission for a casual yet dapper look, team a black and white vertical striped short sleeve shirt with black chinos. These pieces are super comfy and will look fabulous when worn together. Choose a pair of black canvas high top sneakers to loosen things up.